Francis Marion Hill, the founder of our Hill branch in New Mexico, was born in May 1857 in Cisne, Wayne Co., Illinois. He was the father of Herbert Hill born in New Mexico. Francis' father was John Green Hill (1804-1875), his parents were Obedience Cullum and "Big" John Hill (1767-1830), himself the son of Reverend William Hill, himself the son of William Hill and Susannah Smither. I'm sure that I am speaking for Hill cousins everywhere when I say that what we want most to know is how and when our Hills came from England. We have very good information on our line into the late 17th century and we do not have far to go before we get back to England. 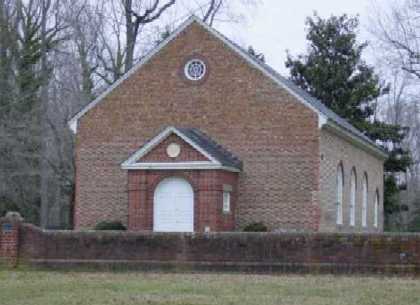 The main sources about our Hills in the 17th century are the Parish Register of Christ Church, Middlesex County, Va. 1653-1812, the Amelia County, Va. Will Books, the results of DNA testing currently being undertaken, and the "Joshua Hill Foster Papers". Born in 1763, Joshua Hill was more than half a century younger than his father, William Hill. At an advanced age in 1850, Joshua dictated the account of family history now known as the Joshua Hill Papers to his grandson Joshua Hill Foster. Some excerpts from the papers made by Robert Hill during the 1880s are included at the very bottom of this page. From these sources it seems that we are looking for the origins of an Episcopalian (therefore someone for whom there should be baptismal records) named William, who was born in Maryland in about the 1670s, who married in Hampshire, Virginia (now West Virginia) in about the 1690s and died in middle age in Virginia, Middlesex County. 1. The theory of the Sion Hill ancestry for our William Hill (Susannah Smither) that dates back to the turn of the century and was actually published in the National Genealogical Society Quarterly in 1928 has been discredited. 2. Papers left by Hattiebelle Hill sent to me by her great-nephew John Hill of Tokyo (descendents of Joshua Hill) suggest, among other possibilities, that William Hill, Sr. was born in 1665 and married Ruth Avery. His father John Hill died in 1688 and married Hannah Brewster. His father John Hill (1624-1685) came from Plymouth to Boston 1630, free man 1642, taxed at Dover NH 1639 grantee, married Elizabeth, later settled in Dover N.H., inherited land from his Father John Hill married Elizabeth Strong, daughter of elder John Strong. According to the Joshua Hill Foster papers: "The father of the first named William, was born in Maryland & moved to Virginia." "_________Hill born in Maryland, married in Virginia (Hampshire) died in middle life & had two sons (as below) & several daughters." Note by Robert Hill of Brandon, Fl. : Hampshire County is in today's West Virginia. "(William) Hill, b. Maryland, married Va. (Hampshire), died in middle life; two sons (as below) and several daughters)." Married Ann(e)_____ (b. probably Virginia; died Middlesex County, Va. 15th January 1726, buried 17th January) (Page 183 of Parish Records). "William Hill, the father of Joshua Hill Sr, was the son of _________Hill (most probably William Hill, as Joshua Hill remembers) was born in Middlesex County, Virginia in the spring of 1700. The said William Hill had but one brother, whose name was JOHN, but many sisters, one of whom married a DUDLEY-one a WHITIKER-one a PANNELL in Amherst (County)-one a Smither. He, the said William married in King George, (County) Virginia, SUSAN SMITHER, & settled in Caroline County, Virginia, where were born of said marriage ten sons and one daughter. Joshua Hill states all children were born in Caroline County, Virginia. 1. Isabella Hill, born 1st May 1698 (from Parish Records). 2. William Hill, born about 1700, Middlesex Co., VA, died about 1787, Surry Co., NC. According to the papers Joshua Hill Foster papers he was born in Middlesex County, Va in the Spring of 1700, had one brother, John Hill, and several sisters. Their father, thought to have been also named William, was said to have moved to Virginia from Maryland, where he was born (but not found in parish records). He married Susannah Smither. 3. Ann Hill, baptized March 30, 1701. 4. Elizabeth Hill, baptized March 2, 1706/07. 5. John Hill, baptized 1 October 1710 (Page 76, Parish Records), died Amelia County, Va. 1779. (Joshua Hill Records). 6. Mary Hill, baptized May 10th 1713. (from Parish Records), married RICHARD CARTER, June 4, 1733. 7. Dianah Hill, Parish records say born 25th August, baptized January 22nd, 1714. Birth must have been 1713; married DAVID BARWICK, May 30, 1734, Middlesex Co., VA.
8. Priscilla Hill, born September 17, 1718. VA.037 GENEALOGICAL INFORMATION ON THE HILL FAMILY OF MIDDLESEX COUNTY, VIRGINIA. (IT INCLUDES INFORMATION ON THE CONTROVERSIAL WILLIAM HILL SR. (B: CA 1710), WHOM SOME FEEL WAS SON OF SION HILL JR. (OF SURRY CO., VA). THIS INCLUDES PART OF DATA TAKEN FROM JOSHUA HILL FOSTER PAPERS-EVIDENTLY WRITTEN WHEN JOSHUA HILL SR. WAS ALIVE CA. 1850-55, IN THE ALABAMA STATE ARCHIVES). IT INCLUDES A CHART. PAGE 10, WILLIAM HILL was buried in the Churchyard February 12th, 1669. PAGE 14, MARY HILL, Daughter of Thomas and Ann Hill, was borne the 14th of February and baptized the 6th of April 1679. PAGE 17, EDWARD ELLIS & SUSANNAH HILL, both of this Parish, was married the 7th of July 1678. PAGE 21, WILLIAM TIGNOR JR. of Fairfield Parish in the County of Northumberland and DOROTHY HILL, of this Parish, was married the 18th of July 1682. THOMAS THOMPSON & ELIZA HILL of this Parish was married 17th of September 1682. JOSEPH HILL, Servant to Joseph Harvey was found dead in the woods the 24th of January 1678. PAGE 26, WILLIAM HILL, ye son of Thomas and Ann Hill was baptized the 20th of July 1684. PAGE 30, REBECCA HILL, ye daughter of Thomas & Ann Hill, baptized at ye lower Chapll (Chapel) 28th February? 1686. PAGE 33, Ditto REBECCA, Daughter of Thomas & Ann Hill. (Christened November 28th). PAGE 46, ISABELLE, the daughter of William & Ann Hill was borne the 1st of May 1698. PAGE 48, ANN HILL, the daughter of William & Ann Hill, baptized 30th March 1701. PAGE 69, ELIZABETH, ye daughter of William Hill & Ann his wife, was baptized ye same day 1706/7 (March ye 2nd). PAGE 76, JOHN, son of William & Ann Hill baptized October 1st 1710. PAGE 79, JOHN HUGHES & REBECCA HILL married ye 31st of December 1704. PAGE 81, ISAACK HILL & MARGARET JENINGS ye 28th of July 1708 (marriages). PAGE 82, WILLIAM HILL & FRANCIS NEEDLES 7th of September 1710 (marriages). PAGE 84, RICHARD HILL, dyed January ye 23rd & was buried January ye 24th 1714. PAGE 86, THOMAS, son of William & Frances Hill, born May, ye 20th 1711. PAGE 87, MARY, daughter of William & Ann Hill, baptized May 10th 1713. PAGE 88, WILLIAM, son of William & Frances Hill born November ye 7th 1712. PAGE 92, DIANAH, daughter of William & Ann Hill, born August 25th, baptized September 25th 1715. PAGE 96, RUSSELL, son of William & Frances Hill, born February ye 23rd 1716, baptized April 21st, 1717. PAGE 103, JUDITH, daughter of William & Frances Hill, born June ye 2nd (1718? ), baptized May ye 30th 1719. PAGE 110, THOMAS, ye son of William & Frances Hill, borne June ye 17th, baptizes July ye 15th 1722. PAGE 118, NEEDLES, son of William & Frances Hill born August ye 12th, baptized September ye 12th 1725. PAGE 123, FRANCES, daughter of William & Frances Hill, born January ye 26th, baptized March ye 10th 1727. PAGE 129, ANNA, daughter of William & Frances Hill, born July 25th, baptized August 30th 1730. PAGE 149, FRANCES, daughter of Russell & Anne Hill, born February 25th, baptized 1738. PAGE 170, WILLIAM BROUGHTON & JUDITH HILL married January ye 22nd. 1737/38. PAGE 176, WILLIAM HILL dyed May ye 8th 1720. PAGE 183, ANNE HILL dyed January ye 15th & was buried January ye 17th 1726. PAGE 188, RICHARD HILL, dyed January ye 18th. was buried January ye 22nd 1731. PAGE 192, FRANCES, Daughter of Russell & Anne Hill, dyed March ye 12th 1738/39. EDWARD HILL died February 20th 1736. (Sent to the Secret: Office October 1737). PAGE 196, WILLIAM, son of William Hill dyed April ye 25th 1746. FRANCES, Daughter of William Hill, died May ye 30th 1746. PAGE 200, JOSEPH BROOKS & JUDITH HILL married October 30th 1773. PAGE 201, JOHN OWEN & MARY HILL married October 30th 1777. PAGE 286, HUMPHREY, son of Needles & Jane Hill, born April 7th 1755. Note: The earliest marriages are not included in this work as they may be found in the Christ Church Parish Register. John P. Hill and Elizabeth Watts, Bond 2 February 1829, Surety & Witness, Leroy H. Trice. Page 100. Leonard Hill and Miss Sarah Thacker, Bond 4th October 1872, Surety & Witness, Lewis Burwell, Page 6. Needles Hill and Miss Letitia Morgan, Bond 4th October 1758, Surety & Witness, Ph. Mountague, Page 10. William Hill and Sarah Blake, Bond 22 September 1787, married 23rd September 1787 by John Mullins, page 31. William Hill and Nancy Davis, Bond 1st February 1804, married 6th February 1804 by William Fritchett of Matthews County, Surety and Witness, William Norton and William Matthews, Page 57. CHART SHOWING THE ABOVE CONNECTIONS AS I (Robert R. Hill) UNDERSTAND FROM THE ABOVE INFORMATION. 2. Ann Hill, baptized 30th March 1701. 3. Elizabeth Hill, baptized March 2nd, 1706/07. 4. John Hill, born 1710. 7. Dianah Hill, born 1715 (Parish records say b. 25th August, baptized January 22nd, 1714. Birth must have been 1713. CHILDREN OF THOMAS HILL & WIFE ANN RUSSELL, AS TAKEN FROM CHRIST CHURCH RECORDS OF MIDDLESEX COUNTY, VIRGINIA. 1. Mary Hill, born 14th February 1679. 2. Rebecca Hill, born 30th August 1682, baptized on the 17th of September 1682. (Believed to have died by 1686). 3. William Hill, baptized 20th July 1684. 4. Rebecca Hill, (2nd daughter given this name) was born 28th November 1686, (Church records give this date as being baptized, not born). She was baptized (In Lower Chapel?? ), she married 31st December 1704 to John Hughes. EXCERPTS FROM: JOSHUA HILL FOSTER PAPERS, ALABAMA STATE ARCHIVES, FROM ACCOUNTS OF THE HILLS, AS TOLD BY JOSHUA HILL TO HIS GRANDSON JOSHUA HILL FOSTER. "William Hill, the father of Joshua Hill Sr, was the son of _________Hill (most probably William Hill, as Joshua Hill remembers) was born in Middlesex County, Virginia in the spring of 1700. The said William Hill had but one brother, whose name was JOHN, but many sisters, one of whom married a DUDLEY-one a WHITIKER-one a PANNELL in Amherst (County)-one a Smither. He, the said William married in King George, (County) Virginia, SUSAN SMITHER, & settled in Caroline County, Virginia, where were born of said marriage ten sons and one daughter. These children were JOHN HILL (who died young), WILLIAM, the Clergyman, ELIZABETH, who married Holbert & settled in Pendleton County, South Carolina. THOMAS who died in Georgia, ROBERT, who lived & died in Stokes County, North Carolina, UEL, who lived & died in Abbeville, South Carolina, having no male issue. DAN, who lived & died in Williamson County, Tennessee. JESSE, who lived & died in Edgefield, South Carolina. JAMES, who died in his youth. JOEL & JOSHUA, who were twins. JOEL moved to North Alabama & then died." "The father of the first named William, was born in Maryland & moved to Virginia." "John, the brother of said William, lived in AMELIA COUNTY, VIRGINIA & there died, leaving many sons, among them ISAAC, JOHN, a mechanic, WILLIAM, a calico printer." (HE LEFT OUT MOSES HILL, WHO IS NAMED IN WILL). (REF: AMELIA CO., VA. WILL BOOK 3, PAGE 28-30, Wrote 11 February 1777, proved 15th September 1779). "The said William first migrated from Caroline County, Virginia to Stokes County, N.C. (then Surry Co.) with all his sons in 1772." "1._________Hill born in Maryland, married in Virginia (Hampshire) died in middle life & had two sons (as below) & several daughters." Note by Robert Hill of Brandon, Fl. : Hampshire County is in today's West Virginia. "2. WILLIAM HILL born 1700 in Middlesex County, Virginia, married a widow in same county. She had a grown son, morning after marriage brought her apron full of money & poured it in his lap saying "give my son 50 pounds out of that"-removed to North Carolina in 1772-died in 1787." "3. WILLIAM HILL 2nd child of William Hill- a baptist preacher in Revolution-encouraged soldiers." "John Hill, child of William Hill, wild, stout, fighting cr. (crazy?) moved to Nashville-afterwards to Kentucky." (Note by R. Hill: This quotation sounds very familiar with a John Hill, son of William Hill and Hanniniah Elizabeth Halbert). 4. William Hill (son of William Hill) Secretary of State in North Carolina married a widow Blount." Note by Robertt Hill of Brandon, Fl. : That name of Blount seems to possibly relate to a Whitmell Hill family in N.C. and does not seem to be the Rev William Hill, son of William Hill Sr. & wife Susanna Smither. I thought it was Rev William Hill Jr that was Secretary of State? "James Hill (son of William Hill) married daughter of Col. Hunt, who lived on the Yadkin, died with s. pox (small pox) about close of Revolution." "Robert Hill captain in Rev. (Revolution)." Now, I wonder who has actually seen these papers and where they are to be found. When I tried to obtain copies of them, I was informed of the following by Kristy L. Dixon, Reference Librarian at the W.S. Hoole Special Collections Library of The University of Alabama: "We do indeed hold the Joshua Hill Foster papers. I completely understand your situation concerning your inability to visit the library. I will do everything I can to help you in your research. You certainly may obtain photocopies of relevant material from this collection. We have a complete finding aid for this collection.... I've done a little investigating, and I think I have some information that might be useful. I looked at the online catalog of the Alabama Department of Archives and History, and I believe I located the book for which you are looking. The book is entitled "A brief record of one branch of the Fosters in America / prepared principally by Rev. J.H. Foster, D.D., Tuskaloosa, Ala. at the request of L.S. Foster, Jackson, Miss. With additions by other members of the family." I checked this title in WorldCat to see which libraries worldwide hold this book, and only two do: Alabama Dept. of Archives and History, and the Wisconsin Historical Society. We also have a typewritten manuscript of this book (17 pages) in the Joshua Hill Foster papers... Regarding the Joshua Hill Foster collection we hold, I cannot find any... mention of a Hill family history - only specifically Foster history. I also have been unable to find the location (if any) of Senator Joshua Hill's papers. I've checked several repositories in Georgia and Alabama, and I have yet to locate them.... I am sorry that this was not more fruitful. If you would like copies of the manuscript, please let me know.... I pulled this manuscript and investigated its contents, but unfortunately, there was no genealogical information regarding the Hill Family. It exclusively traces the Foster lineage. I also thoroughly searched through the series of the Joshua Hill Foster collection that deals with family history and correspondence, and I cannot locate anything that resembles the account for which you are searching. I do apologize that we weren't more helpful to you. If you have any other requests or questions about this collection or any other, please don't hesitate to contact us."